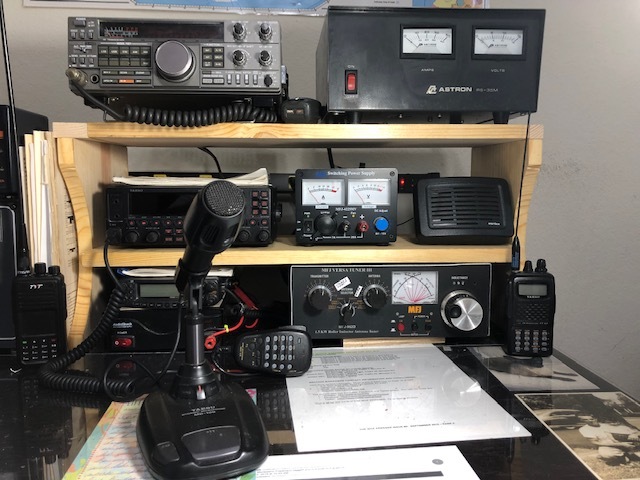 You may list items via Email at swap@lwra.us and be sure to include your callsign or join us every Tuesday evening at 19:30 est on 147.330 or via Echolink node 429535. Here is the perfect sturdy shelving for your ham radio operation. Made from pine wood and selling for $25 each. 24″ wide x 9″ deep X 12″ high (6 inches between shelves +/- 1/2″) A coat of polyurethane is applied to the surface for protection. Currently 7 in stock. Longer sizes available upon request. A great 200 watt HF rig that works up through 6 meters. Comes with MB 480: Allowing face plate and main body to function as one unit. Also comes with PG-4Z Extension kit and separation cables. Great, like new condition, always used in a non-smoking environment. I have been requested to post the following HF and VHF/UHF equipment for the widow of a Silent Key in Winter Haven. Models, condition and prices are listed below. #1-Denton Radio, Clipperton-L Linear Amp, 15 meters through 160 meters. 8/10 appearance. 2 kw PEP SSB. 1 kw on CW. Drive power needed is 65-150 watts. Has four 572-B tubes in the final. Weighs about 50 lbs. $450. #2-Kenwood TH-K2 Dual Band HT. Needs antenna replacement. 7/10 cosmetic condition. $75. Has wall wart charger included. #3-Icom IC-2100 mobile VHF transceiver. Operates on 12 volts. Has two meter capability only. $50. #4-Kenwood model KPS-12, 12 volt, 12 amp power supply. Operates on 120 volt AC power. Looks like new 10/10 cosmetic appearance. #5-Kenwood power supply Model PS-5. 12 volt, 20 amp output $100. 10/10 cosmetic appearance. IF interested, Please email me at KU8Q@ARRL.net. Locals get first pick before these go on used equipment web sites. Kenwood TS-440S with built in mechanical tuner. Also included – Kenwood MC-60 desk microphone. Astron AS-35A power supply, Kenwood CAT cable to operate radio from your computer also. For sale:Yaesu FT-857D All Band radio, w/ DTMF MH-59 Microphone, $750.00 Firm. Janice Falcon in Zephyrhills, KM4IEY, has the following for sale. I have a Yaesu FC-40 Remote Antenna Tuner for sale, works perfectly, asking $140. Call Rick at (772) 781-8889 or catch me on the net or at the membership meeting. MFJ-4117 Power Injector for A/T. AMERITRON ALS-600S LINEAR AMP– LIKE NEW! PRICE REDUCTION!!!! 600 Watts HF SOLID STATE linear amplifier (No Tuning Required, switch bands and it switches with the transceiver). This amp comes with 120V switching power supply. Also includes ARB-704 relay box, multiple cables to connect to several different brands of transceivers, and comes with the 10 meter optional coil. Price for EVERYTHING WAS $1450, JUST REDUCED TO $950,, local pickup. You can use them mobile if you wish, or use as base station with 12 VDC power supply.